Complimentary tasting at the winery for You and a Guest. Club Release Parties: Pick up your wine, taste new releases, appetizers included. 20% discount on all wine purchases. Free admission to Holiday Festivals. Discounts on special events held at the winery (ie Valentine's Dinner). Invitation to special members-only events, including our Summer Bar-B-Que! Receive 3 bottles of wine four times a year (February, May, August, November). We will select the wines to include in your shipment or You may contact us to select the wines you wish to have included. Everyone 21 and over, with a valid credit card can join. No checks to write. Your credit card is automatically billed each shipment date. After your account is billed, the wine is held at the winery for pick-up. Shipping is available upon request. An adult signature is required to receive wine shipments. 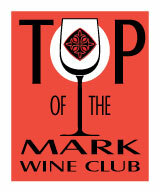 Top of the Mark wine club membership can be cancelled at any time after acceptance of 3 shipments. Cancellations must be requested in writing and received 15 days prior to the next wine club shipment..